The buses in the RIPTA parking lot on Melrose Street rest in orderly lines. Beside them, rows of cars glitter behind a chain link fence. 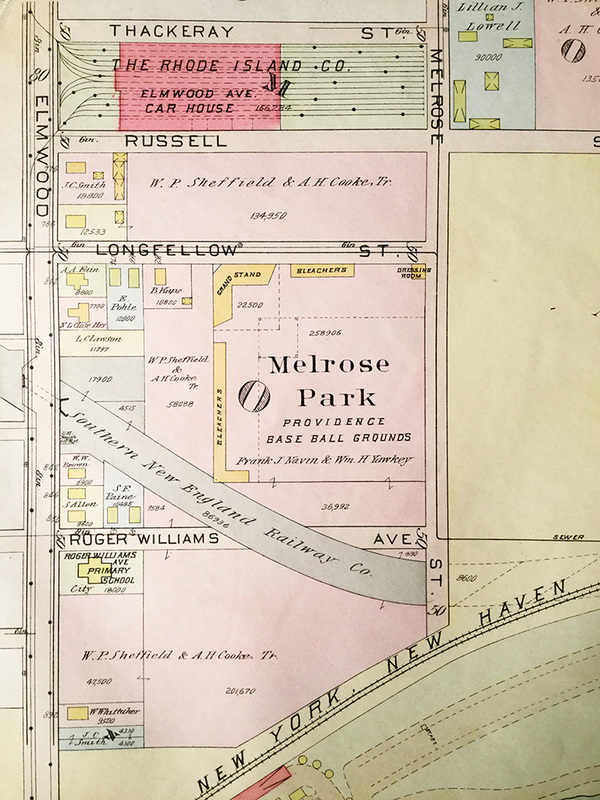 This lot in South Providence used to echo with more than just the low rumble of engines-it was once the site of Melrose Park, a lively ballpark and home to the Providence Grays from 1906-1918. 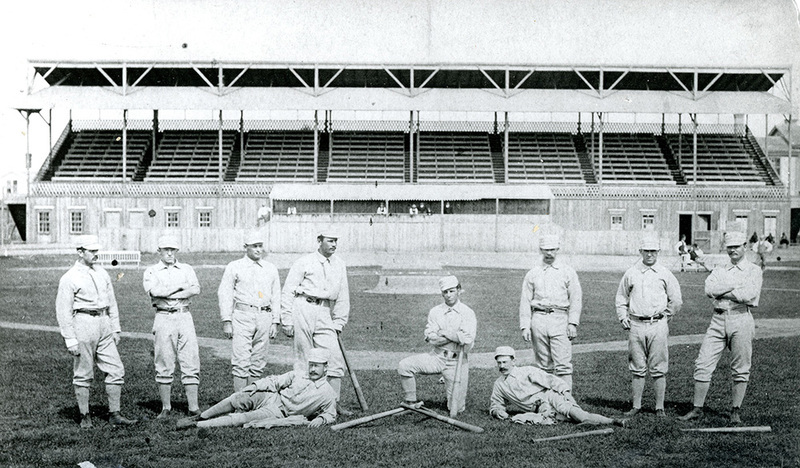 The Grays began playing in 1878, the same year that the Providence Baseball Association formed. Their first ballpark was on Messer Street, just south of Willow Street; in 1884, they won what was, according to some, the first World Series, a playoff between the National League and the American Association. The Grays later joined the International League, and began playing in Melrose Park in 1906. The new ballpark had bleachers around two sides, a grandstand, and a dressing room on the corner where a parking attendant's hut now sits. The highlight of the Grays' time at Melrose Park was the 1914 season; that year they won the International League championship, beating out the Baltimore Orioles 2-0 in a home game. ("Baltimore crumples under irresistible attack," reported the Providence Journal.) An important element of the Gray's "irresistible attack" was a visiting player: a mostly-unknown pitcher named George Herman Ruth, better known as Babe. Babe Ruth made his debut pitching with the Boston Red Sox in July of 1914; after two games with the Red Sox, he was sent to Providence, where he played with the Providence Grays for six weeks, helping them to win the championship before returning to Boston for the rest of the season. Every year in early summer, Melrose Park also hosted a different kind of entertainment: the Ringling Brothers, Barnum and Bailey Circus. 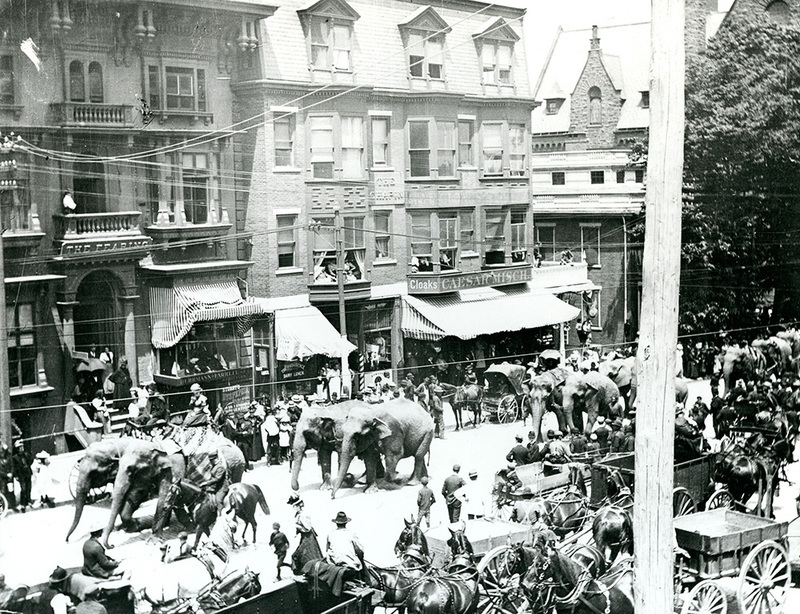 The circus would arrive with cages of animals they claimed "the largest menagerie on earth"--and more than 40 elephants, sideshow acts, and an enormous bigtop tent which they would unroll from trucks and erect in front of an eager audience. The circus attracted everyone from families to wandering pickpockets (the latter eliciting complaints from neighbors in wealthy Elmwood, whose strolls in Roger Williams Park were disrupted by unsavory wanderers in the years before I-95 separated the two areas). When the Grays left the International League in favor of the new Eastern League 1918, they began playing at Weston Field in Cranston, and Melrose Park fell into disuse. In 1920, Whitins Machine Works purchased the field; they knocked down the grandstand and bleachers the next spring, but never built on the lot. 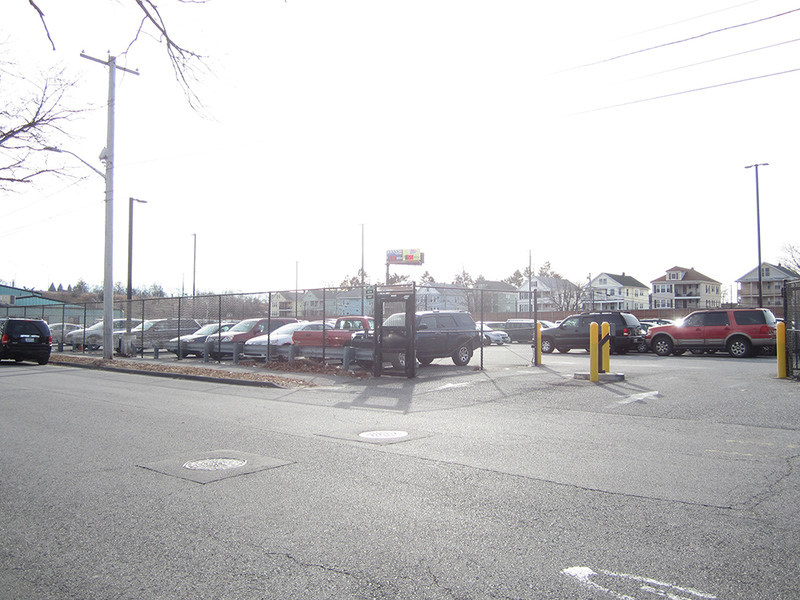 It eventually became parking for the Rhode Island Public Transit Authority's garage on Melrose Street, with buses slumbering where ball fans and circus elephants once roamed. The Providence Grays won the International League championship at Melrose Park in 1914 with the help of pitcher Babe Ruth. Angela DiVeglia, “Melrose Park,” Rhode Tour, accessed April 23, 2019, http://rhodetour.org/items/show/359. "Factory Planned at Melrose Park." The Providence Journal, May 6, 1920. "Grays Win Flag; Beat Orioles 2-0." The Providence Journal, Sept. 26, 1914. Knight, Horace. "A Nostalgic Look Back to the Melrose Park Circus Grounds." The Providence Journal, July 29, 1987.